I'm running low on 1978 samples. This is not a tragedy. The only '78 samples that are affordable in the whisky world are single grains. I've had two 1978 single grains and they only reinforced my opinion that the Grain Emperor has no clothes. 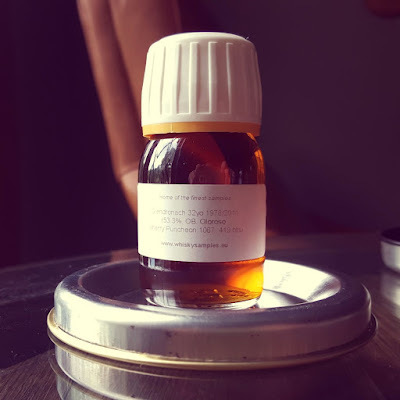 To celebrate my final 30s birthday, I'm busting out the Glendronach single Oloroso cask sample. The once beloved Glendronach single casks have fallen out of favor with many whisky geeks ever since their integrity was questioned by the Ralfy-MAO 1-2 punch three years ago. (I highly, HIGHLY recommend both of MAO's posts, here and here, on this subject.) Nonetheless, the prices of these casks continue to rise because addicts must get their precious. Many of us watch for any sign of dropping single cask prices like we watch for any sign of the GOP taking action against the president they wag their finger at. I've seen the future. Neither is going to happen. That has nothing to do with this review. I've never had a Glendronach single cask whisky that was distilled before 1990. From what I gather, their 1970s stuff is of quality. Lemme see. The color is red, like red dessert wine red. Its nose is enormous. Dark chocolate, figs, old books, clay and coffee. Then dates, old bourbon and a pinch of prickly heat. Waves of toffee pudding. The palate shares the nose's magnitude. Black coffee, figs, dried cherries and bitter chocolate. All this with a layer of roasted nuts on top. After 30+ minutes, a tiramisu note arises from beneath. The roasted note continues into the looooooong finish where it's joined by black cherries, raspberries in dark chocolate and Carpano Antica. It seems to settle into a tamer, more classic sherry cask character. The nose has raisins and prunes. Milk chocolate and vanilla bean. Baked blueberries and a hint of earth. The bitterness cools down in the palate and gets tingly. A soft smoke note. A sticky sweetness. Limes and earth. The finish gets sweeter and saltier. Less bitterness, more citrus. It lingers and lingers. This show is all about the cask. After 30+ years in a fresh sherry cask, a whisky is likely to get thunderous. Here, the nose is fabulous from start to finish. The neat palate was missing something until that tiramisu note arrived. And one doesn't want to drink or eat anything else until the finish finishes. Water really does domesticate this animal, but whether that's a good thing or not depends on one's palate. There's no subtlety in this whisky, especially when neat. Aside from the tiramisu thing, there isn't a lot of development either. And were it not for the Teacher's Glendronach 8yo I tried in June, I'd have no idea what '70s Glendronach malt actually tastes like. These are the sorts of quibbles that keep its score from sailing higher into the 90s, because otherwise this Glendronach is awesome.